Home Business World News OPEC: Iran tells Trump to stop tweeting "It is driving up oil prices"
OPEC: Iran tells Trump to stop tweeting "It is driving up oil prices"
President Donald Trump renewed his Twitter attack on OPEC this week, blaming the cartel for rising gasoline costs. But analysts say Trump's effort to punish Iran by swiftly cutting off the nation's energy exports is what's really driving oil and fuel prices higher. Trump on Wednesday ordered OPEC, the 14-member oil cartel dominated by Saudi Arabia, to take steps to tame rising gasoline costs. He said the group is "driving prices higher," apparently referencing its 1½-year-old policy of capping production to shrink a global crude glut. However, several analysts and banks say the catalyst for the most recent oil price rally is Trump's efforts to punish Iran, the world's fifth-biggest crude producer. Just days after OPEC agreed to increase output, the State Department sent oil prices soaring by announcing it aims to wipe out much of Iran's crude exports by November. Since then, U.S. crude oil has surged nearly 7 percent, and briefly rose above $75 a barrel for the first time since November 2014. Crude oil accounts for roughly half the cost of gasoline. "I think what has raised prices 10 bucks a barrel is more the administration's policy about getting [Iran's] exports completely cut off to the rest of the world, which they seem intent on," said John Kilduff, founding partner at energy hedge fund Again Capital. That policy now threatens to leave the world with a shortage of crude and rob Americans of the gasoline price relief they usually get in the autumn. It may even leave drivers paying more at filling stations in the fall, just as they're preparing to cast their votes in elections that could hand Democrats control of Congress. Americans are already seeing their gas bills rise after enjoying years of low fuel costs thanks to a historic oil price crash. The national average for a gallon of regular gasoline is now nearly $2.87, compared with $2.23 a year ago. U.S. gasoline futures are up about 18.5 percent this year and have risen nearly 39 percent since Trump took office. Morgan Stanley on Monday raised its forecast for international benchmark Brent crude by $7.50 to $85 a barrel over the next six months. The bank pinned the revision on Trump's tougher-than-anticipated Iran policy, which exacerbates falling output in places such as Venezuela and Angola. 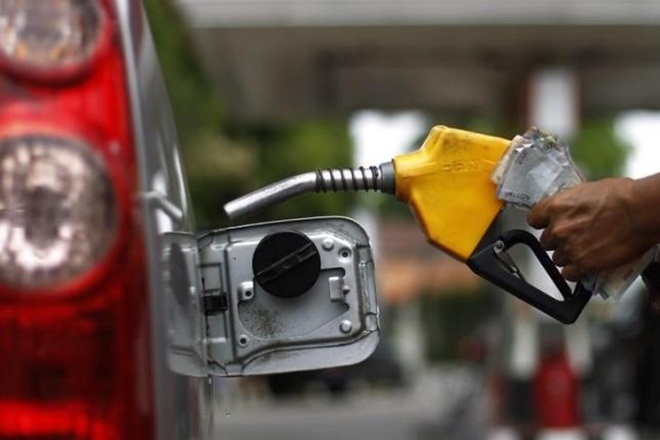 Given the geopolitical backdrop, crude oil prices could rise enough to offset the seasonal decline in gasoline prices that Americans usually enjoy in the autumn, said Andrew Lipow, president of Lipow Oil Associates. If Brent crude rises another $10, to $90 a barrel, the cost of a gallon of regular gasoline would top today's national average, according to Lipow. The same goes for jet fuel and the diesel that powers the nation's shipping fleet. "As a result, the consumer should expect to pay more for their airline tickets," he said. "Higher diesel prices are going to be passed through to the consumer in higher prices for goods and services." Patrick DeHaan, senior petroleum analyst at GasBuddy, expects Americans to see a smaller-than-usual dip in gas prices this fall, due to bullish oil market factors such as Trump's tough stance on Iran. "The national average usually will decline anywhere from 20 to 35 cents. This year it might only be 5 to 10, maybe 15 cents, if we're lucky," he said. 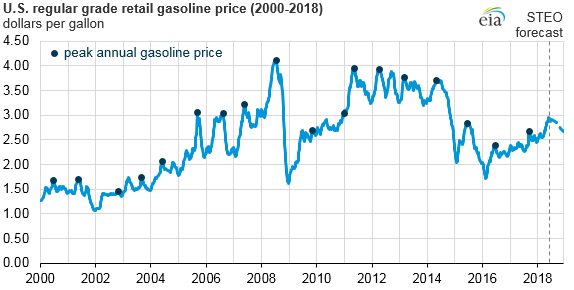 The U.S. government's Energy Information Administration recently forecast that the national average gasoline price is unlikely to breach $3 a gallon, after topping out at $2.96 at the end of May. But some analysts are not convinced. "I would take the bet with the EIA that maybe we haven't seen the highest prices of the year because there's just too much going on and too may things that can lift gasoline," said Tom Kloza, global head of energy analysis at Oil Price Information Service. Those include potential outages at refineries that process crude into fuels, or hurricane-season storms that knock out part of the nation's oil drilling, refining and transportation system, according to Kloza. It's also uncertain that the Saudis can meet Trump's recent request to raise output by up to 2 million barrels per day. While Trump initially suggested King Salman bin Abdulaziz Al Saud agreed, the White House later clarified Saudi Arabia would tap its spare capacity if and when that becomes necessary and only after it consults with other members of OPEC — some of whom oppose further supply hikes. While Saudi Arabia can certainly increase output, pumping an additional 2 million bpd would be "the biggest public test of Saudi's spare capacity," Helima Croft, global head of commodity strategy at RBC Capital Markets, told CNBC. OPEC, Russia and several other oil producers have partnered to limit their output since January 2017 to end an oil market downturn that sent prices to 12-year lows, bankrupted hundreds of U.S. energy companies and piled pressure on petrostates. That strategy put oil prices on a steady road to recovery, but the recovery accelerated ahead of Trump's decision in May to abandon the 2015 Iran nuclear deal and restore sanctions on the country. The cost of oil has surged more than 14 percent over the last three months, with Brent crude racking up its biggest quarterly gain in nearly six years and U.S. crude posting its best quarter in two years. U.S. crude jumped $6 a barrel in the last four days of the quarter after the State Department said it is telling oil buyers to stop importing Iranian crude by Nov. 4. That shocked the market, which anticipated Trump might allow buyers to gradually reduce their purchases, a model created by the Obama administration. Trump's much more aggressive strategy means U.S. crude could soon rise to $80 a barrel, Croft said. "If we're going to go through with this strategy, if we are clearly intent on taking a million and a half, 2 million Iranian barrels off the market, that's what we have to reconcile ourselves to," she told CNBC's "Power Lunch" on Friday. That strategy is "very risky" because it leaves the oil market with few options in the event of supply disruptions, according to Croft. Venezuela's production is already on pace to fall by as much as 1 million bpd this year, she said, while surprise outages in Libya and Canada significantly reduced supplies last week. "We can't afford any more supply disruptions if we're going to be that aggressive in taking Iranian barrels off the market," she said. President Barack Obama started his two terms with oil prices near multiyear lows struck during the economic crisis. U.S. crude then traded between roughly $75 to $115 a barrel from 2010 until 2014, when the market crashed after OPEC refused to cut production to drain a global crude glut. During Obama's final year in office, prices rallied from $26 to about $60 after OPEC finally orchestrated output cuts in partnership with top oil producer Russia. Trump’s tweet triggered reaction from Iran, a founding member of OPEC, whose oil exports have been targeted by US sanctions. “Mr. President, may I ask you, what are you talking about? OPEC has not defined oil prices for the past 30 years, it is a financial market and regional hubs for marker crudes who does it?” Iran’s OPEC governor Hossein Kazempour Ardebili said. “You impose sanctions on major producers, founders of OPEC, and yet you are asking them to reduce the prices?! Since when did you start ordering OPEC! Your tweets have driven the prices up by at least $10 per barrel. 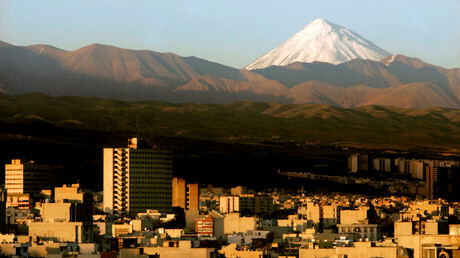 Pls stop it, otherwise it will go even higher!” the Iranian official added. Oil was trading at over $78 per barrel of the Brent benchmark on Thursday, while US West Texas Intermediate was trading at $74.55. While Trump says he wants lower oil prices, US sanctions against OPEC members Iran and Venezuela are adding uncertainty to the market, causing prices to spike.